"Cadet Troop 1314 want to go to on a scouting-related trip to Europe in two years, but they're not selling cookies to raise the $30,000 they'll need to get there. 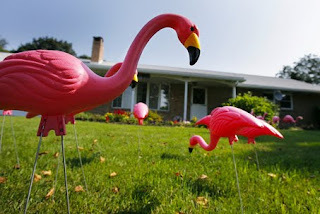 The troop, headed by leader Cathi Bornman, has purchased 100 pink plastic flamingos. For a price, they'll sneak a flock of the birds onto the yard of your choice." Read the entire story here, and definitely let us know about creative Girl Scout fundraising campaigns in your communities!